system stability is also examined. self-gravitating stellar systems, are typical examples. tance of such studies in geology and heavy oil recovery. , Mehta and Bhatia ). ity on the growth rate of the system is also examined. action of gra vitati on . riables have their usual meanings. vkTm is perfectly recovered when 1q. 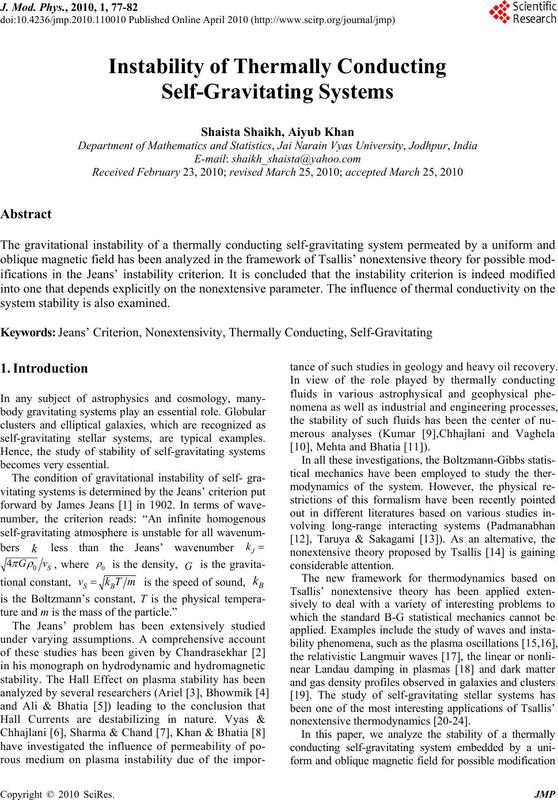 system considered in this paper. exponent and x is the coefficient of thermal conductivity. Let us discuss the Jeans’ Criterion in light of the above. growth rate initially increases in the unstable region. dominantly stabilizing, influence on the system stability. that depends explicitly on the nonextensive parameter q.
ally for any system endowed with long range interactions. open to further verification and deeper understanding. framewor k o f n o nextensive s t at ist ics. entation and quality of the paper. A 199, 1902, pp. 1-53. 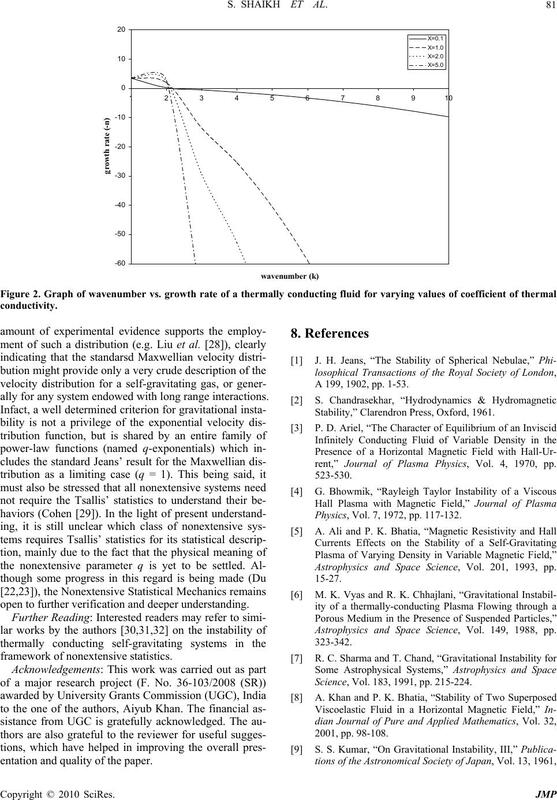 Stability,” Clarendron Press, Oxford, 1961.
rent,” Journal of Plasma Physics, Vol. 4, 1970, pp. 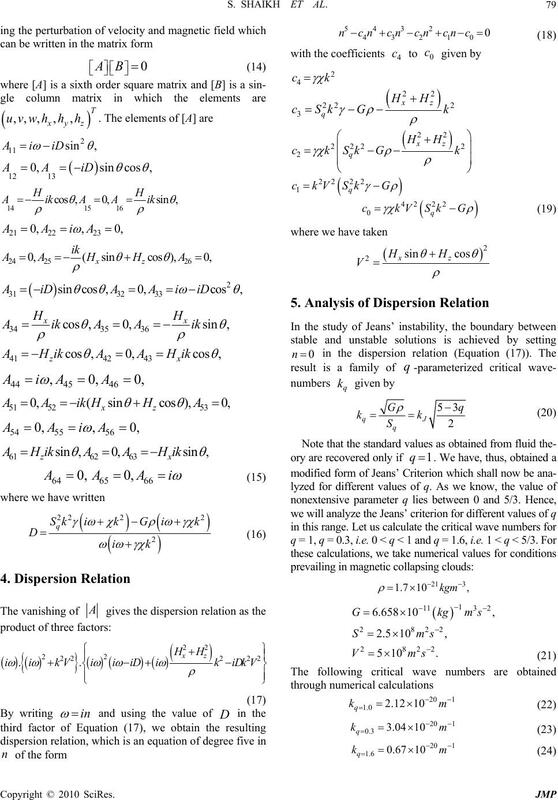 Physics, Vol. 7, 1972, pp. 117-132. Astrophysics and Space Science, Vol. 201, 1993, pp. Astrophysics and Space Science, Vol. 149, 1988, pp. Science, Vol. 183, 1991, pp. 215-224.
tributions to Plasma Physics, Vol. 29, 1989, pp. 617-626. Systems,” Physics Reports, Vol. 188, 1990, pp. 285-362.
of Stellar Polytrope,” Physica A, Vol. 318, 2003, pp. Physica A, Vol. 356, 2005, pp. 509-516. Vol. 61, 2006, pp. 275-280. Processes in Geophysics, Vol. 13, 2006, pp. 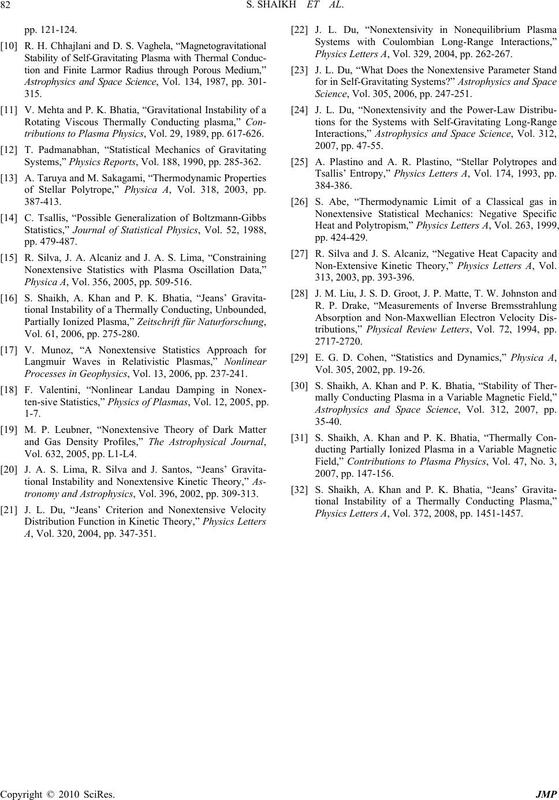 237-241.
ten-sive Statistics,” Physics of Plasmas, Vol. 12, 2005, pp. Vol. 632, 2005, pp. L1-L4. tronomy and Astrophysics, Vol. 396, 2002, pp. 309-313. A, Vol. 320, 2004, pp. 347-351. Physics Letters A, Vol. 329, 2004, pp. 262-267. Science, Vol. 305, 2006, pp. 247-251. 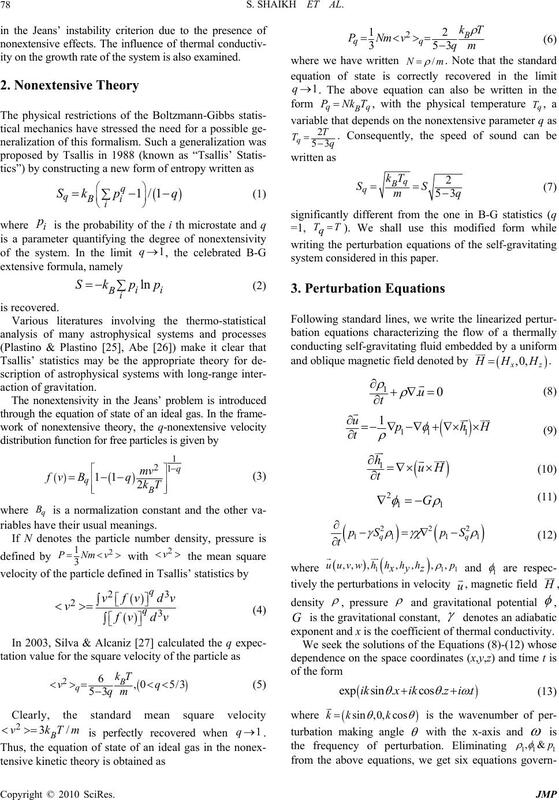 Tsallis’ Entropy,” Physics Letters A, Vol. 174, 1993, pp. 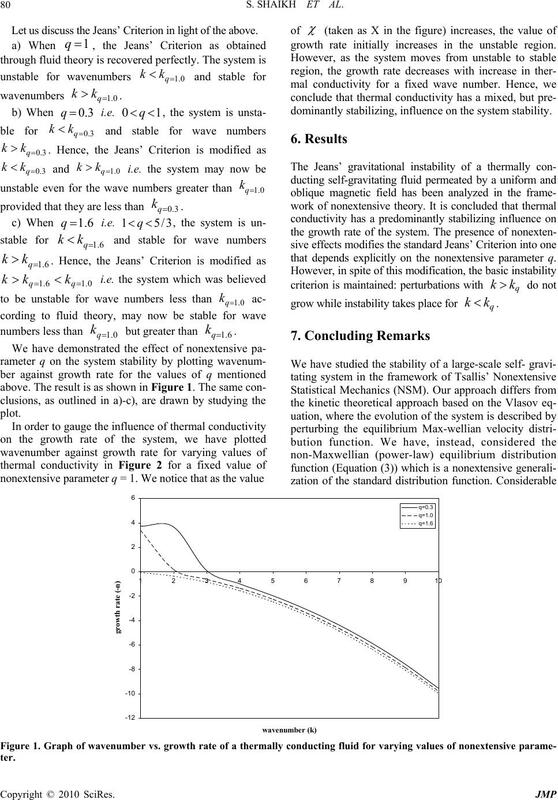 Non-Extensive Kinetic Theory,” Physics Letters A, Vol. tributions,” Physical Review Letters, Vol. 72, 1994, pp. Vol. 305, 2002, pp. 19-26. Astrophysics and Space Science, Vol. 312, 2007, pp. Physics Letters A, Vol. 372, 2008, pp. 1451-1457.